An electric car conversion technology is relatively easy. An electric motor run by power stored in the battery bank propels the electric vehicle (EV) forward. The addition of gears will enhance the efficiency of the motor. The battery needs recharging from time to time by including a solar power panel though it takes a lot of time to completely charge the battery. To start with, it is advisable to construct an EV based on a simple design. The final shape would be something like a ‘go-cart’ instead of a normal automobile. Nevertheless, the experience gained by building a simple model will boost your confidence in building a superior electric car with advanced features in the future. The process of building the simplest type of electric car begins with wooden or steel frame and wheels. It also requires an electric motor, battery and a switch for tuning on and off of the motor. The switch will act as an accelerator in the same way as in a gasoline powered car. The capacity of the motor must be adequate to withstand the load of heavy components, frame and at least a driver of the car. The seller of motors will be able to guide regarding the capacity of the motor required for the car. The easiest method of transmission of power from the motor to the wheels is through a belt and pulley system. A body made of fiberglass and Styrofoam can also be included, though it may not be essential. A test drive in an open area may be essential with one or two people in the car. A windshield made of plastic can also be included in the construction. All the parts need to be properly connected by means of wiring. 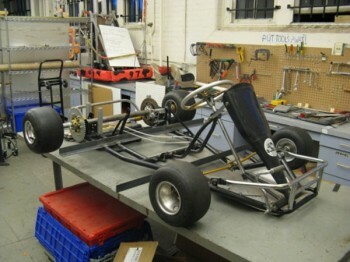 After all the parts including the electric motor with the battery are fitted in the car; the construction of the car can be completed by fixing a steering mechanism. It is absolutely essential to protect the eyes and the ears when building an EV. You should wear protective clothing and an open space with sufficient lighting and ventilation should be chosen for building the electric car. The size of the wooden or door frame should be carefully chosen and wherever required it should be cut to proper size so that it can easily be pass through a doorway or arch. The battery, motor, seats, ‘drive train’, steering mechanism should be assembled on the frame and the switch connected to the battery. The battery should then be connected to the motor. The wheels should be attached to the frame, body and windshield. After completion of all connections, it should be carefully checked whether all parts have been fitted and properly connected before the car is ready for a test drive. There are local laws regulating the use of electric cars on roads and public places. They also require registration. It is important to read these regulations before driving out of home or business property. It is also essential to keep in mind the limited battery capacity and the distances and routes should be carefully planned so that the battery can be recharged at the right time during the trips. In view of several shortcomings, the electric cars cannot as yet replace traditional gasoline-powered vehicles. These limitations include limited battery capacity, frequent recharging between trips and the time consuming process of recharging. A hybrid car has more advantages than the normal electric car and therefore, is extensively used. Hybrid cars use both gasoline and electric current to power the car. Such hybrid varieties are already in use in railroads and military tanks.